Are you a Grinch of a boss? If you're not being transparent about bonuses, the holiday party, or reviews with your employees this holiday season, you just might be. And committing a few of these common holiday season mistakes might make the residents of your company's 'Whoville' grumble, leading to decreased employee engagement and satisfaction far beyond the New Year's holiday. To avoid this, employers should take special note of some holiday season blunders and look for ways to keep them from getting out of hand. Forbes writer Meghan Casserly tapped me for insights into how to spot and troubleshoot these workplace errors. 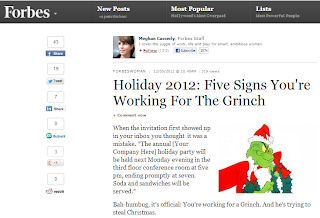 Read her article, "Holiday 2012: Five Signs You're Working For The Grinch" to get my advice. Thanks for including me in your story, Meghan!